Sand, Wind & Stars: "Most Livable City"
In the 2009 Mercer Report on Quality of Living of cities, Vienna takes the #1 spot. Why it took so long for them to recognize that is beyond me. I reached the same conclusion on my first visit to Vienna almost 15 years ago. At least, they agree with me now. The city remains the same as in previous times: charming, civil, cultural, cosmopolitan, efficient, uncomplicated, upbeat combining quaint, grand, clean and safe in one adjective. Although there seems to be a lot more tourists, I don't think it has grown in size. It is as civilized as it can get especially when it comes to your wallet. You get more bang for your euro than in other European capitals. Staying away from Stefansplatz had its blessings. The downtown core seems to be undergoing a major facelift. The cobblestones on the streets radiating from the Cathedral were getting ripped up, replaced with rectangular concrete blocks. 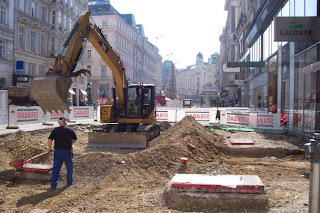 On the Graben, a popular pedestrian mall, construction crew, material and equipment share the landscape with cafes, bistros, espressos, gelatos and hot dog stands. The pictures explain the scene. 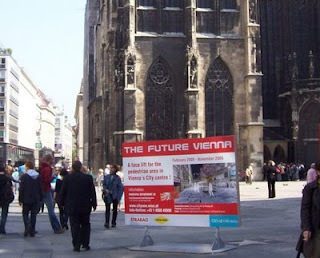 I wondered if this is Vienna's version of the stimulus package or Boston's "big dig". But in a place where bitte is the most commonly uttered word, it wasn't so bad going around construction barriers. Just a few bitte this and bitte that. p.s. I discovered "bitte" in Austria is more than just "please". It can have 1001 uses, all polite.